Peter Phillips is the former director of Project Censored, an organization exposing underreported news stories and highlighting the important links among a free press, media literacy, and democratic self-government. The APC office is upstairs from the Fuji Steakhouse in the College Mall building. Stairs are at the west end, sharing an external door with the steakhouse. 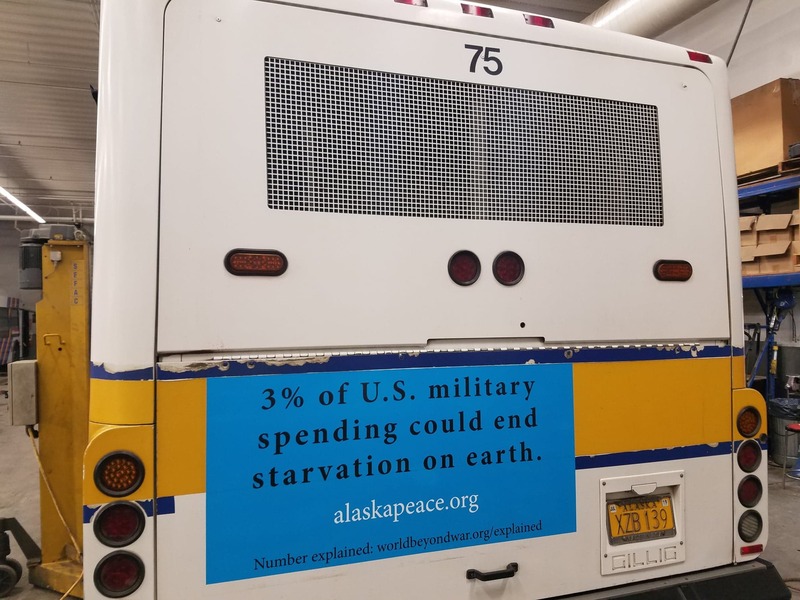 Since early March Bus #75 has been moving around the Fairbanks area with a message from the World Beyond War Billboard Project prominently displayed. It’s been seen by several people so we know it’s out there. Feel free to leave comments on this post to share your feedback, any thoughts you have about the message and any conversations that arise. If this is a medium that APC supporters feel good about, there is also the opportunity to eventually run other messages on Borough buses. See https://worldbeyondwar.org/billboardsproject/ to see other message designs available. All welcome! Board of directors elections – Join the work for peace! – and planning events such as the Peace Feast, Fair booth, and more. Contact info@alaskapeace.org or call 479-0981. Agenda. 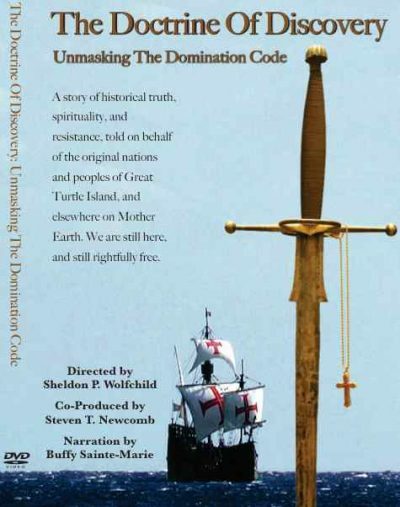 Papal Bulls of the 15th and 16th Centuries gave “Christian” nations the right to discover and dominate lands occupied by non-Christian peoples. Through an 1823 Supreme Court decision by Justice John Marshall these bulls still form the foundation of laws concerning indigenous peoples in the United States today. This movie explains how this happened and its implications today. Sponsored by the Alaska Peace Center, the University Community Presbyterian Church, and Native Movement. See the flyer. Arkansas Death Row inmate Kenneth Reams will call us from his cell to discuss solitary confinement, the injustice of the felony murder rule, and racism. Suggested donation $10. All proceeds to benefit Who Decides, Inc., a nonprofit dedicated to educating about the death penalty through art. Sponsored by the Alaska Peace Center and the Unitarian Universalist Fellowship of Fairbanks Social Justice Committee. For more information contact Alison Carter (907-322-8661, alisoncarter2@yahoo.com). The monthly business meeting of the Alaska Peace Center (held on the first Thursday of every month) will take place at 5:30 pm at the APC office, upstairs in the College Mall, 3535 College Road Suite 203 (stairs are at the west end sharing an external door with the Fuji Restaurant). All are welcome! Draft agenda for APC January 3, 2019, meeting.